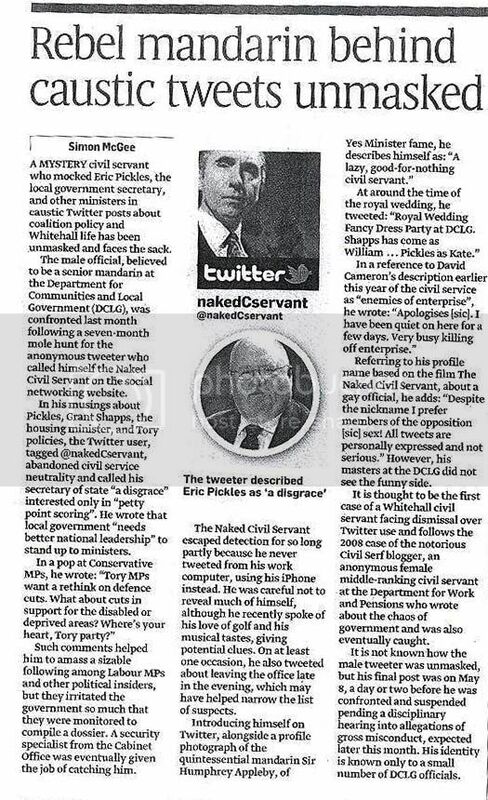 Civil service Twit outed | Curly's Corner Shop, the blog! I haven’t bought The Sunday Times for a few months now, perhaps because it takes a full week to read, so I am grateful to a reader for dropping me in this clipping from yesterday’s edition. Sorry if the quality isn’t great but it is not my photocopier/scanner responsible. You can click on the thumbnail on the left to open a fuller sized version of the clipping, just hoping that you can all read it OK up here in South Tyneside. The gist of the story is that a civil servant working at the local government department headed by Eric Pickles was found to be operating a Twitter account , not from the office, but from his iPhone out of work, penning Tweets as the “Naked Civil Servant” he has been suspended prior to disciplinary proceedings alleging gross misconduct. The principle and moral lesson to be learned from this article is that your anonymity on the internet cannot be guaranteed unless you are far more clever than the security experts, something for someone up here to think about and stew over! « North East council backs South Tyneside in Twitter row. This illustrates a point made previously, namely that employees who breach organisational IT Policy or express terms of contract regarding their personal conduct are at risk ofinvestigation and disciplinary action. In fairness, it would appear that the content of these tweets were fair and ironic comment or mildly satirical, very, very different to what was directed at the plaintiffs in STCs action. Good, well made point. It’s evident that some self-appointed arbiters on this subject have little idea how egregiously offensive and malevolent many of of ‘themonkyeyhouse’ comments were and are. They’re still accessible for anyone minded to know. One can’t help but speculate on what the reaction to the Naked Civil Servant would have been had his comments plumbed the depths of ‘themonkeyhouse’. We might have seen the army on the streets, Bletchley Park ex-employees brought out of retirement and all of the intelligence and scientific experts deployed in finding the culprit. Yes, folks, ‘themonkeyhouse’ is as bad as that. To call Pickles and Shapps “Laurel and Hardy” would I trust be claseed as allowable satire, and effective comment. One does not have to descend into allegedly false and malicious comments about their private lives, or families. But such a comment could be the proverbial “kiss of death” if tweeted by an uncivil servant. I’m still stunned and astounded at the level of ignorance (and I apologise in advance) shown by letter writers in The Shields Gazette on the subject. Apart from the generally held incorrect belief that our council is launching a libel action with our taxes, the majority of writers appear not to be knowledgeable of the worst slurs in the offending blogs, and many believe that the writer has been inactive for two years! It would not be right, of course to illustrate the point by repeating those slurs, because it might prejudice any future action. However, I believe it is right to outline the inconsistencies in Cllr. Khan’s media campaign based upon the premises of privacy and confidentiality. There is a principle at stake in as much as he, and many others, feel that it is OK to use social networking as means to publish whatever they like, whenever they like, without the fear of facing their own personal responsibilities for what is bashed out on the keyboard. As the Attorney General has pointed out today, this is clearly not acceptable. Well done for getting a different viewpoint out in the Gazette sir, better than the spoon fed diet we’ve had for the last week. The Indies websites have always been in really bad taste and I’m ashamed that their words will be linked to South Tyneside for a long time in the future. I don’t know if the Monkey/Chief Whip/Returning Monkey copied the Indies newsletters or if the newsletters copied the websites, but they all looked, smelled, and sounded the same, just plain nasty. Anyone noticed Cllr. Mrs. Branley’s outright condemnation of Mr. Monkey/Chief Whip? I disagree completely – the principle at stake is whether it is acceptable to use public funds to finance what is – at best – a civil, private matter between individuals. And remember that if the council had not pursued this action with such vigour then outside of a minority of the local political community very few people would have been aware of – let alone cared out – the contents of this blog. The Streisand Effect in action as it were. There is also the question of why this action was taken against Twitter when the blogs involved were hosted on completely different platform. And for the record – lest my objectively is called in to question – I have no allegiance or involvement with any local political organisation or individual. Indeed, given the behaviour of some of elected members in the last few years, I think the contents of a obscure blog is the least of the borough’s problems. You may well disagree, you have every right, but unfortunately that is the law, it is not acceptable to libel another on websites or social networking sites. Let us be clear about something here Peter, STMBC is NOT pursuing an action for libel, it is debatable whether or not it has the power to do so, however we have linked to previous cases a few threads back which suggest they may have the power in certain circumstances. Perhaps you may like to go and read about them. I do not know why they have chosen to ask Twitter for disclosure about five accounts which also include the @fatcouncillor Twitter feed, one must assume there are very good reasons. Are we agreed that attacking the mothers, fathers, brothers or sisters, aunties and uncles of elected representatives in the most vile sexual terms, for example, should be totally off limits? Are we agreed that the time honoured principle of NOT attacking council officers, who cannot publicly defend themselves, should also be strenuously upheld? They still might have been unaware of it, had the said councilolr. not made contact with scores of journalists around the country, don’t get me wrong, that is his right, but it would be unfair to lay the blame for the ensuing publicity at the doors of those who tried to be more delicate. Then who is paying for the libel action then? Furthermore, what’s the difference between the accusations made on the Mr Monkey’s blog and the accusations of those who blame Cllr Khan as being the man behind the blog? Shouldn’t they both have had evidence before making these accusations, or is that a privilege only afforded the egotistical and pampered Town Hall mafia Labour councillors? Mr. Newton, what libel action? Have you read somewhere that a libel action is taking place? If a libel action does take place it will need to be funded by the plaintiffs. Now if you read back a bit you will see the court papers filed in the Californian court, they lay out the plaintiff’s case, and what they claim is evidence of defamatory remarks, it is there for you to read, please avail yourself of the opportunity.. I believe that the disclosure action against Twitter is designed to add to the evidence or confirm evidence, these are things that we will have to be patient with before there is an outcome. The plaintiffs have offered some of their evidence, and if a libel case becomes necessary the defendant(s) will have the opportunity to do the same. STC reputation has been damaged for years pal, whats new?? strikes me how Graham riggs blog is the front page of the gazette totally backing STC actions of going to the usa court with costs that us (the tax payer will be paying) . Lets have it right most of the council are corrupt in ways you would not believe. post that and take what you will my full name ip addy color of my skin tight shite stained boxers, will be given and take me to court waste more of the tax payers money. My only real connection is that I pay my council tax to them and am interested in their affairs and how this borough improves its position in life. Wondered when we would get a literate blogger like this on the scene; Peter Smith v Michael Peel, now that is debate! I’m afraid I could not disagree more with Peter Smith’s comments. Local authorities are creatures of statute; they must act within the law. If it is felt that an LA has acted unlawfully, or ultra vires, remedies are available to those disposed to complain of such. To the best of my knowledge no one has thus far complained of either: what people are complaining about is the judgment involved in pursuing this matter and the amount of money expended on it. However, such objections have already been dealt with summarily and effectively by LL.B, a regular contributor to this blog, in response to an earlier article by Curly. The Council would not have taken this action if the allegations made on ‘themonkeyhouse’ blog were not so manifestly defamatory and seriously injurious to the reputation of the Council, the borough and scores of individuals (Councillors, Council Officers and, in some cases, members of the public). The many offending comments were placed on the World Wide Web for anyone searching for ‘South Tyneside’ to see, and it therefore begs the question: which Council would not take exception to, inter alia, being portrayed as Tammany Hall and to some of its politicians being accused of being corrupt political racketeers? Moreover, without prejudice to the outcome of the Council’s investigations, it is fairly widely believed that an elected member of the Council may have been partly or wholly responsible for the libels set out in the Monkey blog.If this is one of the reasons for the Council taking the action it has, it is a persuasive reason. We’ll all have to wait and see whether that is the case. Yes, a lot of the publicity nationally and locally has been stimulated, but much of it has been prompted by individulas subject to the order issued by the San Mateo Court. The issue for me is reducible to the irresponsibility of some individuals, bloggers, twitterers etc, who are prepared to anonymously breach Court injunctions, or traduce the reputations of anyone they have a mind to target. Such behaviour was bound to lead to an aggrieved party taking legal action. Given the vituperative and defamatory content of ‘themonkeyhouse’ blog, I think that I would be critical had the Council not embarked on the course of action some now complain of. I can assure that they have not. In any way close to convincingly. In lines replies appear to have been disabled. Apologies for the fisking. I am very familiar with the case at hand thank you – probably more so than everyone else here. Unfortunately I fear that speaking freely would compromise my career opportunities so must post with the thin veneer of anonymity that an IP address brings. I am aware that STC are not pursuing a libel case. As explained, it is simply not permitted to – the law is very clear on this (and I’ve seen nothing here to indicate otherwise – despite some wishful thinking). However whichever way you cut it, STC has spent anywhere between £75K and £250K (and remember that this amount does not include the time of council Officers involved with this) of rate payers money in financing the legal work that any libel case – regardless of who pursues it or when it comes to pass – will rely on. As I’ve said, the question is whether the use of this money is justifiable when the issue is one of a civil nature between two private individuals. Why we must we assume there are very good reasons? That isn’t in question. The council officer has the same remedies available to him as any other member of society – a private prosecution for libel. Unfortunately I fear the Officer in question has merely been included to ensure the authority can use the very tenuous “duty of care” argument. One which falls apart under scrutiny – I certainly don’t see the Gazette using such a line to pursue the identity of this blogger, despite some of the more vicious accusations towards their staff. “And remember that if the council had not pursued this action with such vigour then outside of a minority of the local political community very few people would have been aware of – let alone cared out – the contents of this blog. The Streisand Effect in action as it were. Perhaps, but if the council had not pursued this folly the blog would have remained a little read, obscure dirty little corner of the internet. It is directly thanks to these actions that the blog in now in the full glare of the public. And one can hardly blame said councillor for using the media when he has the full force of a LAs legal department working against him. I’ll say again – it is completely unacceptable to use public money to fund this grudge match. This is a civil matter between private individuals and any costs should be incurred by them. All this action has done is to re-inforce the image that local authorities are unaccountable, opaque, banana republics with no respect or concern for the people they’re meant to work for. It’s behaviour that simply feeds the likes of the Daily Mail. Any damage caused to the reputation of our area and authority should be laid directly at the feet of those who decided to pursue this costly legal action using public resources. Just checking here to confirm that in-line replies are still available for use. I do welcome your comments even if they don’t coincide with my own views. So STC and all publicly funded/accountable organisations have got to run their affairs to satisfy the dictates of the “Daily Mail”? I have endeavoured to draw attention to what I consider to be various relevant legal issues in employment and tort law which may be relevant to this situation. I am concerned that STC clearly and openly declare what the costs involved are, as I would be if it was a company in which I have shares. Perhaps, Curly, can enlighten us as to whether or not the constitution of STC has any relevance in this. I am still awaiting a legally reasoned counter to the argument that ultimately “the polluter should pay”. Furthermore, the most sensible and legally savvy potentia civil/criminall defendants whom I have encountered keep their public comments to a minimum, and let their lawyers do the talking. I still wonder why the Communications Act 2003, section 127 has not been used in this particular case, given the precedent set by the unfortunate Councillor Gareth Crompton, whose tweet, whilst naive, one off and somewhat offensive, pales into insignificance when set beside what is blogged on the site under investigation. Apols; should read GARETH COMPTON. Gareth Compton immediately withdrew the offending comment then apologised, and the subject of the comment refused to support a prosecution; nevertheless this harmed his political career. Robert Chambers was prosecuted under the CA 2003 s127 for tweeting a joke in bad taste concerning an airport; his career potentially ruined. No criticism of the costs involved, plenty of, in my opinion, justifiable criticism of the use of criminal legislation to investigate, and, in one case, prosecute, one off tweets, which harmed noone and posed no credible threat to anyone. Reflect upon that, please. Chambers and Compton were both identified as part of a criminal case and bear absolutely no relevance to the strictly civil dispute here. The CA 2003 simply does not apply and it is disingenuous to suggest otherwise. Both the Chambers case, which proceeded to trial, thence to appeal and the Police investigation of Gareth Compton with the consequent potential damage to their respective careers raised very, very serious concerns regarding internet freedom of speech amongst the legal community and those like myself with some experience of and a general interest in legal matters. These were both respectable professional men who had no malicious or threatening intent, and it is important to bear that in mind.Worth reading the numerous comments about these cases and reflecting upon them. Right, so I was under the wrong impression that a libel case was being brought, does that mean then that the court papers which you offered I should avail myself the opportunity to read, cost nothing to file, it’s a free service is it? I don’t think I ever suggested that, did I? I’m simply asking the question, who’s paying for it? Is the cost is being met by the plaintiffs and out of their own pockets or are the folk of South Tyneside getting the bill? I am not here to answer on behalf of South Tyneside Council, that is not my role, my role is to provide the opportunity for discussion. Besides, we both know the answer to your question. So you’re happy for your taxes to be used to pay the plaintiff’s legal costs then? I don’t think you are following this too well, I’ve stated a number of times that the plaintiffs will have to privately foot the bill for any of their personal legal actions, the council is footing the bill for an investigation on its (and our) behalf. If these allegations were made on council owned computers, during council working hours by a council employee then fair enough an investigation is warranted. I don’t agree with a cash strapped council using precious funds to pay for an investigation into personal attacks by a blogger from a non council owned website, especially when jobs and services are being cut to the bone. Ultimately, if the town hall mafia succeed in unmasking and suing ‘Mr Monkey’, it will still leave them looking like petulant, egotistical control freaks. Each of those is a statutory duty of a local authority. Attempting to identify an anonymous blogger so that elected members can use that information to settle a personal grudge is most definitely not. It is absurd to compare costs incurred with the application of a LAs legal responsibilities with attempts to identify an anonymous blogger. Sorry I just don’t get the “throwaway” line assessment of the Councillors and Officers authorising and engaged in the investigation, one of the reasons for which is to determine whether or not STC IT/ employment/ use of computers terms and conditions have been breached in allegedly transmitting “information” to those X Factors promoting the blog site. These were not legitimate humorous satirical blogs or carefully gathered well corroborated evidence based analysis and criticism, such as one might find on the properly monitored Con Home Local Govt blog site. However,I agree that STC should disclose the costs and, if possible, the legal advice provided. Whatever your view on OUR money being used to finance an international hunt for a primate, I think most residents would expect a decision to commit to pay the alleged £75k-£250k costs (which keep rising) should have in fact been taken at a meeting of the full Council – it wasn’t (as usual), and when you think about it the parties concerned have missed an absolute trick. So, which elected members and Officers took the decision to spend OUR money in this manner, where are the minutes of the relevant meeting, what was advice from ‘the professionals’ at that meeting and subsequent to it, did relevant parties declare their pecuniary interest ?? Somehow I think the FOI Officer at STC is going to be rather busy at the moment…….although I’m sure the town hall shredders have been in overdrive of late! It will make for interesting viewing if the parties concerned do indeed finance their own legal action; they’ll have to advise the Court exactly which parts of the two blogs they consider to be defamatory…….….and then the real ‘monkey business’ will begin. I don’t think ‘Mr Monkey’ is the only one ‘sweating’ at the moment. I fully support your statement in the Gazette. The vile monkey blog has damaged South Tyneside. Those behind it need to be brought to book for their disgusting actions. And if the allegations made in the blog turn out to be true, what then? Or would you rather it was just all swept under the carpet like certain South Tyneside Labour councillors prefer to do with things they’d rather the wider public did not know about (allegedly). The only way of proving the allegations would be in an open court, you couldn’t sweep that under the carpet. Blogging apolitically, and well aware of what a statutory duty is, and also that LA regulatory services can and must use discretion in financially difficult times whether or not to investigate, where the complainants have a remedy in civil law (Sale of Goods Act) against supplier, particularly where luxury goods are involved which pose no risk to public in that there are no safety concerns. Nice try. Take the membership card out of your back pocket and tell us bloggers what it says so we can make a more informed decisions as to the ‘apoliticalness’ of your posts. What’s with the Regulatory Services beef?? The Council provides many services across many functions – most of which have been cut to save money, which has then in turn been used to pay leading American attorneys. What’s more important, a school crossing patrol officer, or the ego’s of certain elected members?? You mention civil action – why didn’t the Laird just splash the cash himself…..like other minions in the Town Hall would have been left to?? And here’s a thought, what happens when they search the jungle and find the monkey homeless and without so much as a banana to his name – will relevant parties pay OUR money back ?? Do me a favour…..
Just a suggestion, not to be taken as written in stone. As for your final point, yes, I can see the size of the huge risk involved there. Just as I could see what was in the minds of two Chief Executives who also saw a huge risk to South Tyneside’s reputation and ability to attract investment and jobs. They had a difficult balance to weigh before making a commitment. No further comment; I am only interested in provoking legitimate discussion. No “beef” with LA regulatory services, but Police can investigate serious and complex TMA 1994, s92 offences, and aggrieved complainant purchasers can pursue individual civil claims in Small Claims Court relatively inexpensively. Just floating a perspective and inviting comment. Answer the question please!! – you’re so ‘apolitical’ you would be denied the opportunity of serving on the relevant jury if selected. It’s an entirely legitimate question to ask, particularly when you have referenced people attacking those who support ‘the Council’s view’ (aka the views of 3 members!) as being ‘the usual suspects’. So is it Lab, ConDem, Prog, Indy, Real Indy (I can’t remember the rest!)?? So you advise ‘complainants’ to take civil action – do you suggest the council fund it for them too?? Furthermore, you mention internal disciplinary procedures for staff etc. Firstly, if any info is released and it’s in the public interest then thats perfectly permissible, secondly it’s a shame that the same codes of conduct don’t appear to apply in the same way to elected members and lastly, concentrate on the behaviour of the parties involved in this cyber war as from what I see in the press WE cannot afford the Council to lose anymore staff ! ‘Rob’ – apologies for perhaps appearing picky (particularly given the ‘validity’ of my numbers which follow) but this is an important point, it’s not ‘officers’ it’s ‘officer’ – from memory representing 1/2 pages (1 allegation) of the court document, the other 60 odd relate to those whom must be obeyed (well, only if you’re a card carrying member). Curly. The council say they are acting in the interest of officers & Councillors. But when a councillor writes on a blog about a resident of south shields, And the resident complains, They do nothing. Some like to think that they are acting for the wider community not just a council employee and three other plaintiffs. As for your other point YOU have the final sanction, at the ballot box. Not if the (alleged) ballot rigging carries on, in which case WE don’t have the final sanction at the ballot box. Thanks for that curly, What i was getting at was the ( BRENDA ) Saga. The council found out who the councillor was and did nothing and would not release the name, Again thats the council looking after its members and who cares about the residents who vote these people in, Because for some reason it always brushed under the carpet. Thanks for providing link to Council’s Constitution; section E merits some study by all” blogistas”. Looking at s127 of CA 2003 and guidance notes, not entirely convinced of its irrelevance to this matter, but would appreciate input from a more knowledgeable source, such as a CPS lawyer. Also important to bear in mind that Council Officers may well be members of professional societies, institutes or associations which have ethical rules and standards regarding member’s conduct. Interestingly, the principal character in a recent John Grisham novel relied upon “snail mail” as he described it in order to transmit sensitive information, a point worth bearing in mind. Small Claims civil actions by ” consumers” are not financed by LA’s, but by the aggrieved plaintiff him/herself eg someone who had suffered mild, but uncomfortable food poisonng might sue the restaurant, but the relevant LA’s Environmental Health Dept would investigate regardless of whether or not the “victims” were residents of the investigating LA.Some LA regulatory services take on powers enabling them to investigate and prosecute under legislation such as the Fraud Act 2006, but they ar not under a duty to do so, some regarding that as a function of the Police. Curly, what’s the point of having a sanction when ballot boxes containing ‘disputed’ votes allegedly ‘go missing’. Full PR would provide you with the ultimate sanction, allowing everyone’s view in the Borough to be heard within the Chamber. And what about the debacle concerning ‘OUR’ airport Curly – do you not think that such an important matter should have been aired in a forum where every member of the Council could have debated and voted ?? Or is such democracy simply too much to ask for? And please don’t suggest it was the Council Executives taking the decisions in the current matter – read the emails that are in the public domain which show who’s been directing, driving and controlling the primate hunt. As to the ‘reputation of South Tyneside’ – perhaps that’s another blog topic in itself which is sure to stimulate debate. I see LLB has again failed to answer a perfectly legitimate question as to whether they are a member of a political party within the Borough. Why won’t you answer? I never thought party members would be ashamed of the colour of their shirt. And you appear to be advocating the use of further criminal sanction in respect of this matter – I suggest the Council and other agencies keep OUR pennies firmly in their pocket (to be used for more important matters) and allow these cyber war activisits to battle it out in court at their own expense rather than OURS. We are not here to discuss the airport matter in this thread or the redundant issue of ballot boxes which has already cleared through the courts, nor do I think it appropriate to conduct some sort of pseudo investigation into the political allegiances of other commenters, can we please stick to the issue at hand, the use of Twitter and the actions taken by the local authority on this matter. What im saying curly is, Its WRONG for any one to say what they think about the councillors & officers BUT its OK for a councillor to lie and slag residents off on a blog. And get away with it because they are a councillor. That what i ment about the (BRENDA ) saga. We had rugby scores being posted on here a few weeks ago – hardly relevant to that thread. Curly, your opinion is that they’re alleged membership of a political party isn’t relevant – I take a different view, particularly given the one-way direction of the said posts and the fact that they would have to defer if selected to sit on the relevant jury, if indeed the matter gets to court and is handled that way. 2 different opinions (and those of other bloggers), lets agree to move on? Paragraph 3 of my post, relevant and on thread. Last paragraph, relevant and on thread. LLB – how do you know that the allegations are not ‘corroborated’ or ‘evidence-based’ – surely this could only be determined by a Court ?? What may be interesting is if there is a court case who actually turns up to give evidence and for whom ! Personally I wish the allegations, blogs, abuse of our money had never occurred, thus leaving us all free to concentrate on the priorities within the Borough. Curly what is your thoughts about the FAT COUNCILLOR BLOG? Hi Curly, I hope you are well. It might be enlightening if you could give Langdale the link to the court transcripts relating to the ‘disputed ballot papers’. I would myself but I’m posting from a friends’s computer and haven’t got the link handy. Bryan the link was included in this post, but inexplicably it has now gone dead, but the gist of the matter is there, I think the documents were held in a Google Base account, but Google has, I believe, changed many of these to Merchant accounts. Looks like I’ll have to search the internet to see if the document exists elsewhere. Oh and thanks ofr the thought, I am well, and sure I spotted you in a supermarket yesterday morning but it was just too busy to get to you! Political colour or creed, even place of residence irrelevant, this personalised question does not advance the debate/discussion one iota.Peter Smith legitimately challenges my opinion, he expresses no interest in my back pocket. and what it may contain. I think you are all getting a bit carried away with several issues. Just how influencial are blogs? I think many of you are over rating their significance in terms of damage done to South Shields in fact the more you raise the issue the greater it gets publicity thus causing more to become aware of the alleged defamer. Mr Monkey is clearly an ill educated and misschevious person who if he is a councillor will be seen for what he is! But the issue raised above is that of the use of public funding as part of an investigation to uncover Mr Monkey. Several of you have expressed concern that council tax is being used for the investigation – my concern is whether individuals will use the evidence uncovered (gained by the public purse) to then seek personal redress. This I feel would be wrong and I suspect is what will happen. No money being used to bring any libel chgarges but the money being used for the investigation! t will be interesting to see how the council then use any evidence obtained. The reality is it is blogs such as this that have allowed the hype to be expanded and magnified, the legal position of Twitter having to provide customer details made national news for the concern raised on the relaese of Twitter details, not for the allegations made about South Shields. There are more important issues at the moment that we should be concentrating on such as the poor economic state which the Condems are placing us with over a half years virtual nil growth, unemployment and redundancy issues for this region, our young being unable to afford an education and the long term benefit seekers of South Tyneside who are claiming incapacity benefits, job seeker allowances tax credits and God knows what else. The strange situation in Libya which is costing a great deal of money yet so little action against other Arabic States including Syria. I would urge you to get off your high horses and look around you, we need South Tyneside to florish not wallow in the muddy waters you are all constantly agitating. Let the law take its course and then vent your anger! Exercise your energies in supporting the weak around you and trying to promote inward investment. It is time to move on – for now! One naughty little blugger had enough influence to cause the council to spend a small fortune on an investigation Kevin, and another caused the Shields Gazette to come grubbing up to him to write a story based on his comments. Hey, this is as exciting as it gets in this political backwood. Difference between a little light relief vis a vis rugby, SAFC, NUFC etc and a pointless pseudo personalised ” investigation”. Read some Chomsky, that is a man with intellect and academic research skills, who lands telling and literate blows on politicos of all party colours. Kevin, as always, makes some good points. My interest is purely legal, I have no particular interest in the politics within your borough. – contrast those remarks with the ‘I have no particular interest in the politics within YOUR Borough’ written above! For an apparent legal beagle I would have expected some continuity at least. Anyway, more on topic (hopefully), I see that Mr Pickles was in town today and has said ‘I think the Council has to be very careful about this sort of thing…You cannot libel a Council…I am not entirely comfortable that public money has been used in this way’. For balance our Leader described what has been done as ‘proportionate’ and said ‘I think the response from my officers in trying to unmask this person should be supported’. Each to their own. Well done, you passed the test that I set for you; I figured that for some reason best known to yourself you seek to personalise part of your blogs contra moi, and by so doing you advance the debate about the legal issues by 0.However, I might have moved since posting those earlier blogs. Congrats to Michael Peel for letter to “Gazette”.In blogging about this issue my interest is purely lega not politicall, the plaintiffs are Labour and a previous Conservative now Independent that is irrelevant to me; Gareth Compton is a Conservative; my concern is to explore and debate the legal issues surrounding these cases.Let us move on please. ‘Entrapment’! As previously outlined (and having passed my eleven plus again) I’m also happy to move on. I sense a welcome and noticeable change which this issue has brought about; many people appear to have woken up and are finally expressing their opinion (whatever that may be), whether through the local media, online, at the shops, or even ‘down the local’. Hopefully such interest and opinion will be maintained and more importantly stimulated in the direction of the major challenges facing the Borough, as alluded to by previous commenters. Do a search for Carmarthenshire County Council and Libel; fascinating stuff; I agree with your concluding paragraph. The Indy Alliance councillors could do themselves a credit if they all came out and strongly condemned the horrible writings and libels on those blogs, they seem to be the only ones who haven’t yet.. Then they could more cleanly about the money. Another good point made by Helen. What have “The Mail” and “Private Eye” added to the debate or unearthed? How would the TPA react if their promoters were the subject of what they describe as “colourful” comments? Please stop rehashing the Derbyshire County Council case decided in 1993; I doubt if my learned friend in his comment about “uninhibited criticism” envisaged a marsupial scenario of this nature when giving his judgement in that case which was concerned with an issue pertinent to local government administration, not pulp fiction accounts of private lives; the case is irrelevant. Why no national/international press support for Paul Chambers and Gareth Compton, far more deserving individuals as well as real victims of injustice, particularly in Paul’s case which went to trial and onviction. Concern about the costs of pursuing the investigation are justified, and openness and accountability are rightly sought, no quarrel with Langdale there; only in my opinion it is the alleged bloggers, who should be the target of the critics not STC. Will you please stop referring to the CA 2003? As explained, it bears no relevance here – the cases involving Chambers and Compton were criminal investigations and very different from this situation – a simple civil dispute. Also, the 1993 case around DCC is very apt. It is very clear that a LA cannot involve itself in civil defamation disputes. It is quite simple – if the blog is defaming the LA then that is tough. They cannot act. If the blog is defaming specific individuals then they have the same recourse as any other private individual and should fund such a case and associated expenses themselves. Finally you are aware that a marsupial is very different taxonomic order to that of primates aren’t you? To be blunt, you either don’t appear to understand what I post or are deliberately ignoring it. The Taxpayers Alliance article is toxically one-sided. Frankly, talk of libel writs and taxpayers having to foot the bill is tripe that my dog would reject – as well as being a wilful distortion of what I believe STC’s strategy to be. Showing that the offending blogs were defamatory was the lawful means by which STC obtained discovery orders from the US Court. Put plainly, it was a way of securing additional evidence. This course of action having been judged necessary by the denials of the Councillor thought to be Mr Monkey. The belief, that a Council member was partly or wholly responsible for themonkeyhouse content was, one may assume, fairly and reasonably held on the basis of persuasive prima facie evidence. This has been the driving force behind the actions taken by the Council. And why not? The thought that a Council member may have been involved in such activity is disturbing enough; the prospect of it being true gives rise to a sense of outrage. Councillors have better opportunity than the rest of us to raise issues and concerns within the Council. They probably have more clout in, for example, complaining to the District Auditor, or the LG Ombudsman. They also have facilities within the Council to be able to research issues of concern and then to fire their broadsides. So for any Council Member to anonymously resort to website smearing and defaming of political opponents, or any one else for that matter, is arguably worse than an ordinary John or Jane doing so. Why? Because, apart from their public status, Council members must adhere to the Councillors’ Code of Conduct, or risk being removed and/or disqualified from office; the handling of ‘Code breaches currently being the responsibility of Council Monitoring Officers, Standards Committees and the English Standards Board. In believing that it was dealing with a serious case of misconduct by a Councillor, it probably is – and was from the outset – the Council’s intention to proceed against that person relying on alleged breaches in the ‘Code – providing, of course, that the evidence justifies doing so. So talk of the Council pursuing or funding a libel action is so mush tosh. Most people are aware that Councils can not pursue libel actions. It is highly unlikely that any of the plaintiffs in this case will do so either, the costs being too prohibitive. To describe as “colourful” some of the statements in themonkeyhouse blog is as perverse as labelling the Daily Mail “a Trotskyist” newspaper. Finally, if I was Mr Monkey I would be worried about the Government’s Localism Bill which, when enacted, will allow for criminal charges to be brought against Councillors guilty of gross misconduct. Such prospects would cause me to own up now. Thankfully I don’t have that worry. Sorry marsupial was an error, er deliberate mistake. DCC case is irrelevant in as much that this case is NOT about STC suing for libel, but pursuing legal action in an attempt to unmask alleged libeller(s), as Curly has exhaustively pointed out. Read the text of CA 2003 and ponder why it was employed against both Chambers and Compton for naive “one off”non malicious tweets that threatened noone, nor alarmed anyone, then compare their tweets to what was being repeatedly blogged on the primus inter primates site, and, at least, consider whether or not a Police investigation might have been considered at some stage by STC. The actions pursued against the C’s and the allegations of criminality were/are a far greater threat to freedom of speech than the civil action being pursued by STC. Read lawyers comments about the Compton and Chambers cases, particularly those concerning Chambers, who was prosecuted and convicted possibly ruining his career prospects. In the final paragraph of my last post on this subject, it should have started: ” If I was Mr Monkey and a Councillor …”. Sorry for the omission. Will Great North Dog Walk outblog the Great Monkey business? Watch this space. An hours free conversation with lawyers; bet there a number of real victims of ill advised litigation, who would appreciate that opportunity. My opinion is that STC could have looked at the possibility of criminal action under CA2003 and run it past thePolice/CPS, but we need an expert legal opinion on that point, not someone just saying that I don’t agree with someone who clearly differentiates between civil and criminal law issues. Very quiet in the “Monkey House”, but in the world of “virtual reality” local political exchanges there are some cut and thrust twitterings, Pity that the duellists could not be constructively debating how to regenerate and invigorate South Tyneside rather than heading into what appears to be near libel territory; wonder what the mighty Pickles would make of it all; hardly what localism and the “Big Society” is all about, or is it? Some people seem to enjoy learning lessons the hard way. Like i said before curly, It seems to be one rule for your self and the council, THAT its ok to promote lies over on the FAT COUNCILLORS BLOG. OR do you think its the truth? If the Latter pove it to me. Steve, I can only stress, once again, that the @fatcouncillor Twitter account was one of the sites subpoenaed by the council for information from Twitter – no smoke without fire! Sometimes I wonder whether or not the straightforward factual and informational bloggers like yourself are actually read. The council is suing for libel misconception being the most obvious, coupled with the concept that to be supportive of STC one has to be a “card carrier”, whereas you are a Conservative Party supporter. The criticism of the floating of the idea that there may possibly have been grounds for a criminal investigation under the CA 2003 failed to appreciate the fact that the tweeters who were investigated, and in one case prosecuted under the Act had expressed “one off” views that neither realistically threatened, nor particularly offended anyone or anything, and that there are many responsible lawyers who are very concerned about the actions taken whereas the sites under investigation by STC maintained a level of offensive, harmful, some would say potentially threatening and allegedly false content over a considerable period of time. Fair enough curly. But you were banging on in the local paper about what was wrong with the monkey blog and all the lies this blog has on it. BUT you promote the FAT COUNCILLOR BLOG which is lies with A link to it on this blog. Thanks for reminding me that my links need looking at and bringing up to date, there are a few “dead” ones there too. I also promoted the original Monkey site for a short time, and I also have a link to the South Tyneside Independents site, something which I ought to review don’t you think? Its up to you curly what you put on your blog be it ( labour, lib dems,or independent ) What i said in the last comment was you are for the council to find the monkey because of the vile things he wrote on his blog about officers and councillors, And yes you got rid of the link. But so did the Fat Councillor write vile and lies, But still you have a link to promote his lies.